Have you ever wanted to be a queen? Have you ever wanted to have some amount of power and a bunch of people flirt with you? Have you ever wanted to die in childbirth because middle ages? Have you ever wanted to have the church breathing down your neck with accusations of heresy and witchcraft—things you definitely are taking part of—because they’re the church? Good, because that’s your life now. In the game Reigns, you play as a king trying to keep everyone happy under your rule. Reigns: Her Majesty is very similar. Just a queen trying to keep a steady balance between the church, the people, the army, and the treasury. The goal of both is also similar; stop getting reincarnated. Can’t a sovereign just die in peace? Apparently not, since a goddess decided you were chosen for this cycle of queendom for forever. You cycle through cards with different characters and situations. With most cards there is a decision to be made. You make a decision by choosing either the right or left response depending on how you want to do things. The best strategy is trying to stay neutral in all matters. It can be very hard to do, especially if you personally would rather choose an option you like. Making one or more of the meters hit their highest or lowest points will result in the death of the queen. As you progress through the game you get new card decks containing new characters and new situations. These range from a mysterious doctor to a young man who wants to go exploring for new worlds, to maybe a maze in the castle garden. One of the more prominent ones is the deck for the acolyte. She’s the one who will help you find the All-Mother, the goddess who made everything and is also keeping you from dying. 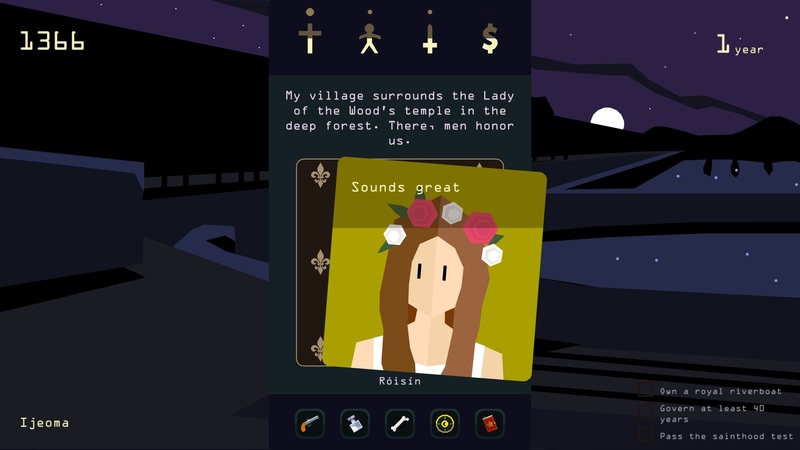 The All-Mother will come to you after you die a few times to give you a spell book. The acolyte will tell you where to find more about the goddess after you meet her. You will die SO MUCH in this game. I’m not sure how high in years I’ve gotten, but it was well past the 2000s. Most of my deaths were related to the people liking me too much, having too much money, or the church absolutely hating me. It’s super important to keep everything balanced if you want to keep up with some of the goals the game sets for you. Some examples include ruling for a certain number of years, finding new decks, and making certain decisions. Meeting every goal is not required to beat the game, but most of them will provide helpful items that may keep you alive. This is a fun game to play if you are bored, especially if you have it on your phone. The game saves automatically, and while there’s an end to the game, you can just go ahead and keep making queens. Just keep this cycle of necromancy going. It very much leans in on the fact that you, yourself, are the queen—not the king. You do not have all of the power, but you could and you should. I definitely prefer this game over the first. 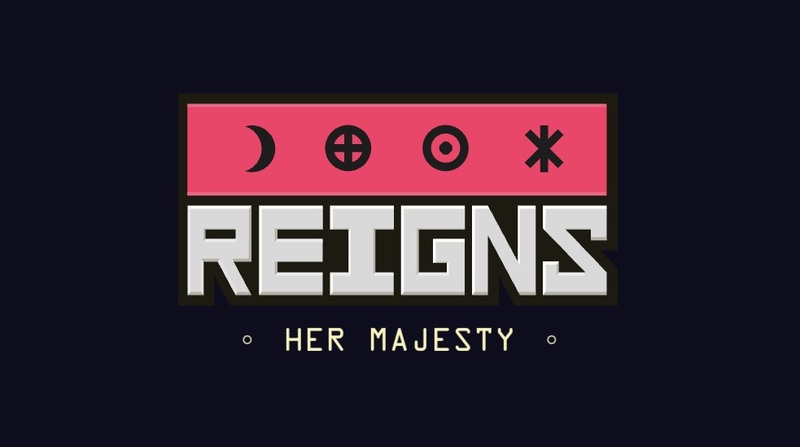 While Reigns had you as the king, who was able to travel to a newly discovered world and partake in crusades, Reigns: Her Majesty felt more personal in a way. Wanting real power and being frustrated that the queen couldn’t have it for the longest time connected with me more. 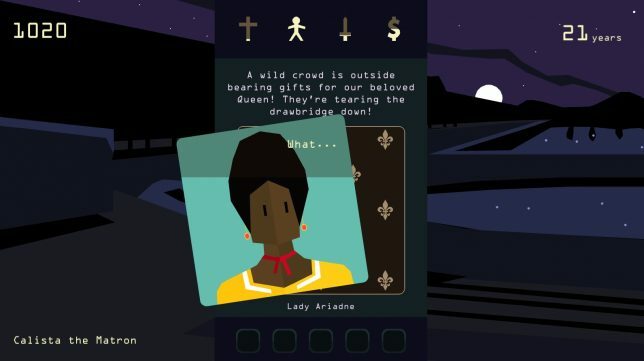 I don’t know if I would say it’s the most empowering game, but it is a good one. 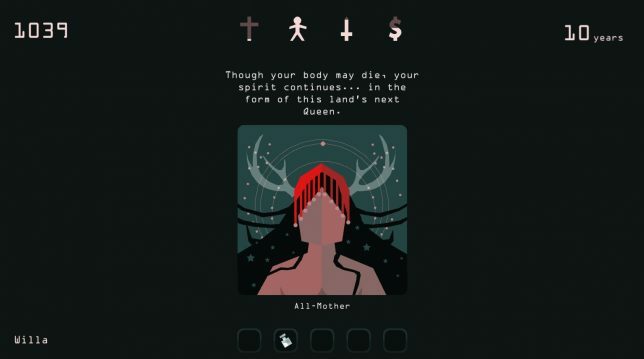 Reigns: Her Majesty is a great game about power and trying to keep everyone happy. One slip could cost your life and you may need to be reborn as a new queen for all eternity. It’s fine. Everything is fine. You’ll get all the real power one day.